Leptospirosis is a bacterial infection that occurs most frequently in mild to tropical climates. Reported cases of contracting the disease are more common during late summer and fall, after heavy rainfalls. Cases are far less common in winter months due to the fact that the bacteria cannot survive freezing temperatures. Dry heat kills the bacteria, but it thrives in stagnant water, alkaline conditions, dampness, and mud. While some areas of the country are more apt to this kind of weather, others are not, thus the leptospirosis vaccine remains a non-core vaccine. Most pets contract the disease when they come into contact with a body of water that is infected with the bacteria, such as a puddle, rainwater, or drain. Other known methods of transmitting the infection include physical contact with saliva, feces, or the infected animal itself. The disease spreads via bodily fluids, through the bloodstream, and usually gets flushed into the kidneys where it often remains and reproduces, infecting the urine. Here it spreads to other animals that come into contact with the infected animal’s waste. 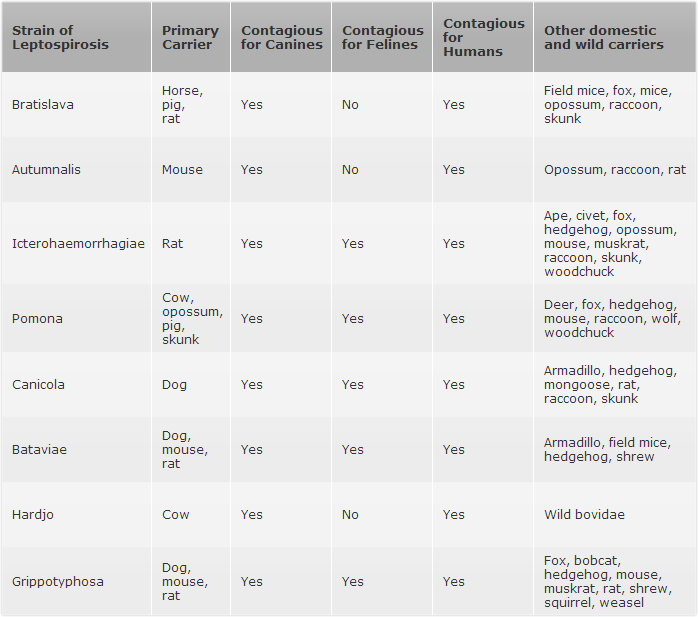 The severity of the infection depends on the strength of an animal’s immune system. Younger animals with less developed immune systems are at a much higher risk of death when contracting leptospirosis. Pets that are the most at-risk for contracting the infection are hunting dogs, pets that live in wooded areas, pets that live on farms, or pets who live with other animals. Because there is a vaccine for leptospirosis and any pet could come into contact with the disease at some point, we do recommend getting your pet vaccinated, especially pets who live in high-risk areas or pets who have contracted the disease once before. Leptospirosis is zoonotic, which means it can spread between infected humans or animals to others. If you have any questions about the infection or would like to make an appointment for vaccination, please contact our office. Pet owners will start to notice signs of a fever within 4-12 days of exposure to the bacteria. We recommend contacting our office at the first indication that something might be wrong. Like most infections, leptospirosis is easily managed when first contracted but can cause more damage the longer it remains in the body; it is also contagious for humans and other household pets. During your pet’s exam the veterinarian will ask you to describe the symptoms that led you to believe your pet was ill. If a leptospirosis diagnosis is positive, this information will give us a good indication of the progression of the infection and will aide in combating the bacteria. Urine and blood samples will be taken and cultured to determine if any bacteria is present, and the body’s immune system response to infection will be tested by measuring antibodies in the bloodstream; this will help determine the level of infection. Diagnosing leptospirosis is always done cautiously. Because humans can contract the bacteria from pets, our vets and technicians handle these cases with extreme caution, and we advise pet owners to also take extreme caution when handling a potential case of leptospirosis. Any bodily fluid is a biohazard and needs to be disposed of properly to avoid contamination of oneself, other pets, and wildlife. Most pets diagnosed with leptospirosis need to be in isolation to prevent spreading infection to owners and other animals. For severe infection that has progressed beyond the early stages, hemorrhaging and dehydration may have started occurring which will require hospitalization. If a pet comes to our facility with either of these symptoms, they will need 24-hour care and observation until their condition improves. Leptospirosis is treated with antibiotics for a period of four weeks or longer, depending on the stage of the bacterial infection. During the period that your pet is being medicated, they should remain under close observation and be checked for any negative reaction to prescribed medications. The prognosis for most pets is positive when severe organ damage has not yet occurred. If you notice any changes in your pet’s behavior while taking medication, contact our office immediately.